We have photos and videos today. The videos first, leading off with a contribution from Tara Tanaka, whom we haven’t seen in a while. This was in fact posted in October. Here’s her encounter with javelinas (also known as collared peccaries, Pecari tajacu. Once in Big Bend National Park I was accosted by a herd of about 50 stampeding javelinas, but they just ran around me. I just returned from a trip that included ten days at Bosque del Apache NWR. Every morning I would arrive before the first light and set up my camera in the refuge next to a pond where many of the Sandhill Cranes and Snow Geese were roosting overnight. On this morning I was the first person there; and about 500’ before I reached the spot I’d planned to stop, I passed a family of Javelina, including a large boar. Even though they’re not usually aggressive, they are large animals and have long, sharp tusks. I parked and kept an eye over my shoulder as I set up—to make sure they weren’t right next to me. Getting to photograph javelina with a telephoto lens is a treat, but having them so close you can capture them full-frame with a 20mm lens—not so much. Just as I got set up it was starting to get just bright enough for me to see that I needed to move about 500’ up the road to have the best vantage spot for the birds. As I was walking, I heard another car and it parked right in front of my van. As it got brighter the cranes began calling and I was really enjoying their chorus as I took photos and videos of them. I glanced to my right and did a double-take, seeing that the Javelina family was walking up right behind the man and woman who were photographing on the far side of my van. I yelled and yelled to alert them, but they never heard me. They left before I did, and when they drove past me I stopped them and asked if they’d seen the Javelina. Javelina?? The father and daughter were quite surprised when I showed them the video on my camera. When I asked I they minded if I posted it on-line, were good sports and gave me permission. The Festival of the Cranes starts this week, and I’m sure the refuge is packed with photographers now. 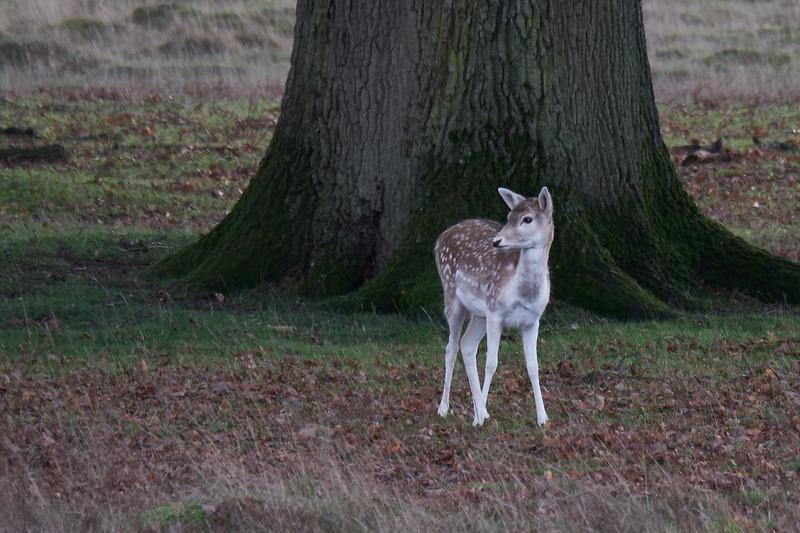 Just remember, when you’ve got your lens pointed at wildlife, there may be wildlife with a snout pointed at you. Great horned owl (Bubo virginianus). This resident of the Snake River in Idaho was filmed in September. I particularly like the lighting, which comes from the sun just before it sets. They are usually nocturnal hunters but sometimes hunt in broad daylight. He makes an appearance nearly every evening near the Snake River. Note at 00:55 he spots something overhead. Since the eyeball cannot rotate in the socket, he needs to track the target by rotating the head. I named him Obi Wan Kenobi. And some photos from reader Rick Jones. Buckspray: a buck shaking off water. 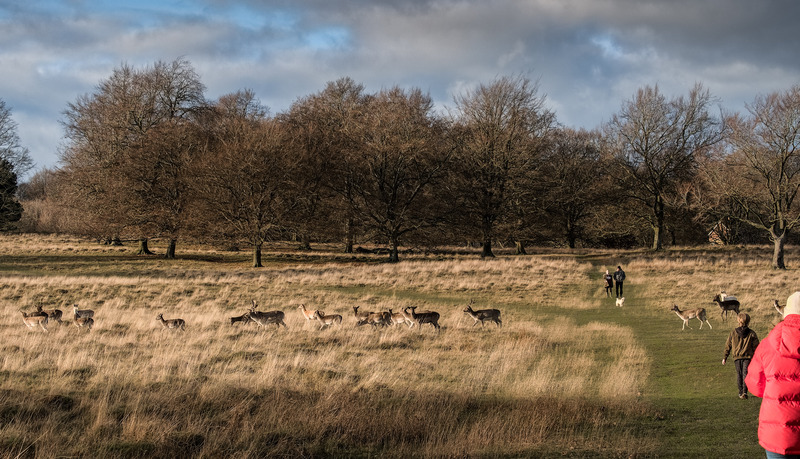 Grazing, Trotting and Watchful show groups of young deer doing their thing. Herd shows a wider view of the herd in the park, with pedestrians among them. This entry was written by whyevolutionistrue and posted on December 11, 2018 at 7:45 am and filed under birds, mammals, video. Bookmark the permalink. Follow any comments here with the RSS feed for this post. Both comments and trackbacks are currently closed. 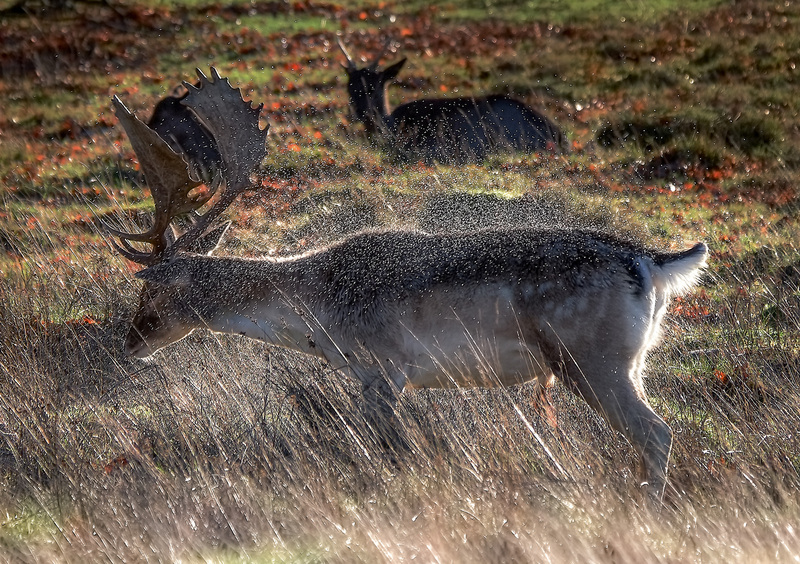 I think my favorite one is the buck shaking off water – the light and shadow, the dynamic subjects – very interesting! I mean, yes, people take videos of their dogs drying off but that’s no wildlife, in the wild. PS I was hanging around for a while hoping to catch a water shake, much to my wife’s discomfort. Luckily our patience paid off! Yes, a very, very beautiful photograph. Nice! 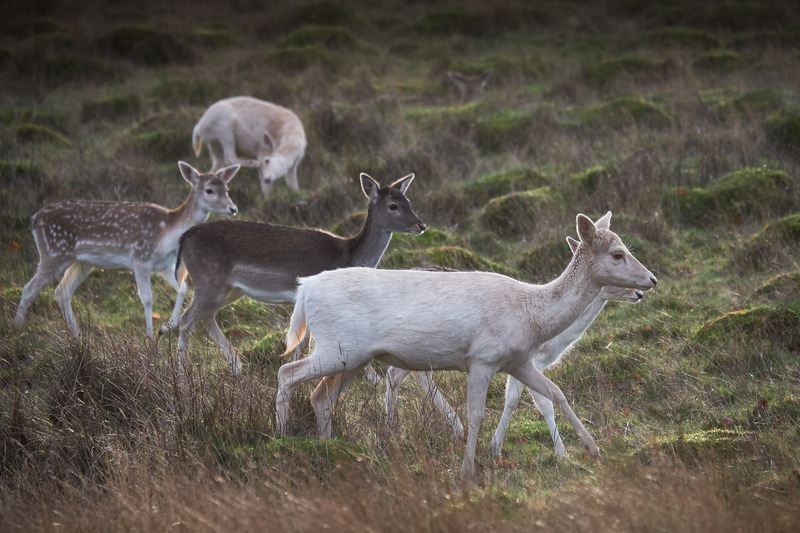 Are there leucistic deer in the herd? Hi Mark, thanks! 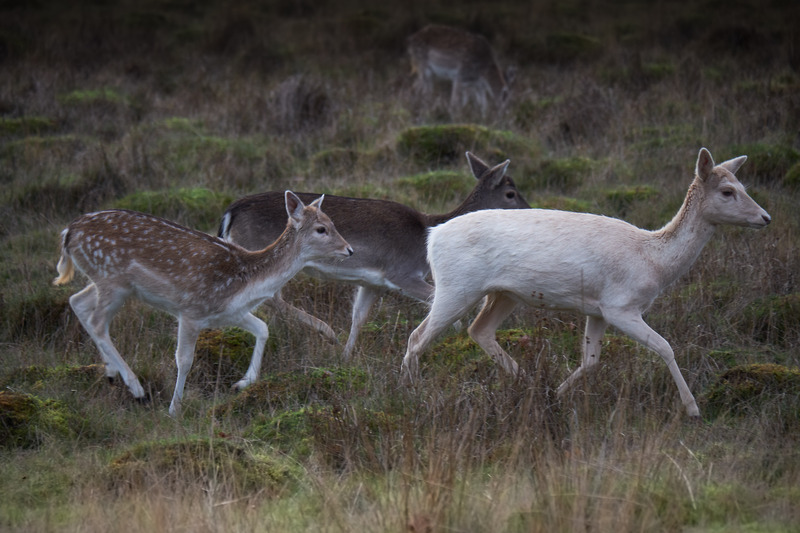 I’m told there are; I sort of presumed the small white ones in the middle two photos were leucistic. I think humans have fed those jave’s before. Or, maybe they smelled some food. They do look like they’re smelling breakfast now that you mention it — good thought. Owls have very big eyes, in fact that if they were to be spherical they would not fit in their heads, so they are somewhat tubular. Tubular eyes obviously can’t turn, so they turn their heads instead. They also don’t have 2 clearly macula’s, as most other birds do. I did some (never published) research on the vitreous and retina of some birds, including a pair of owls eyes. I hate myself now for not remembering what became of their extra-ocular muscles, but I was too much taken by the oil droplets added to the different cones, the pecten, intra-ocular muscles and the other wonders of bird’s eyes. I suppose these muscles must have become vestiges now in owls. Interesting research. You’ve made me curious about the details of bird eyes. Is there a good summary of some of those wonders you mention? The background noise of birds in the peccary video is amazing. I can see why the people didn’t notice them…too many abounding sights and sounds. 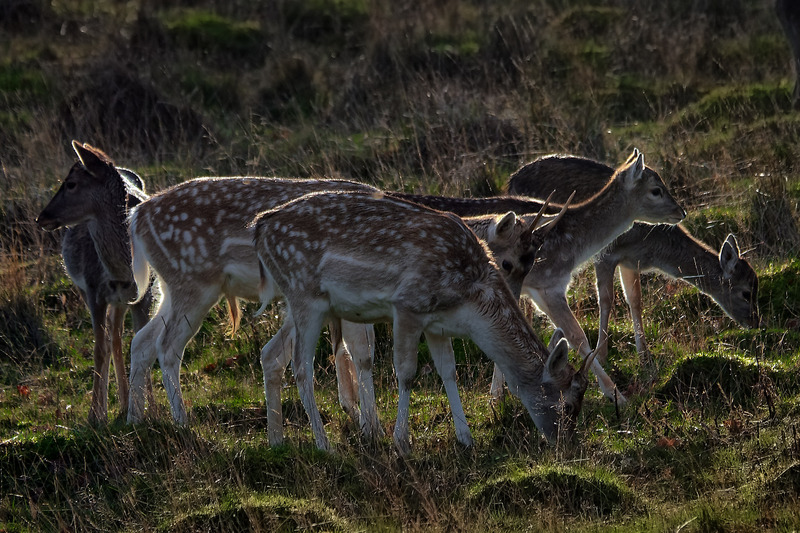 I’ve never seen or heard of fallow deer. Very cool antlers…like a moose’s. Thanks Mark. Those were Sandhill Cranes recorded with my upgraded audio gear. When I get a chance I need to figure out how to turn it into a ringtone. That would be a very unique ringtone!